Varsity team members accepting their award. Photo by Jennifer Jean Miller. 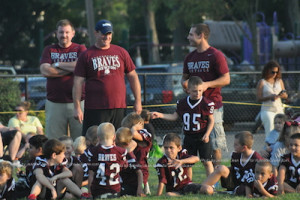 NEWTON, NJ – The Newton Braves Youth Football League (NBYFL) kicked off their season with a season opener pep rally on Friday, Sept. 4. “We’re gathering to celebrate all of our athletes, and what they’ve put into the coming season,” said Dave Young, NBYFL President. Dave Young, League President, at the microphone. Photo by Jennifer Jean Miller. 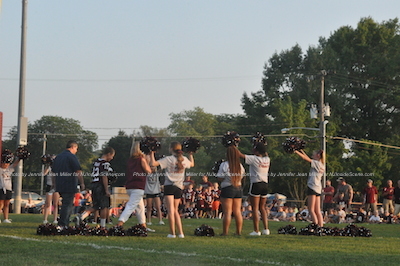 Cheerleaders take to the field. Photo by Jennifer Jean Miller. Young also praised the idea of having the cheerleaders now a part of the league. 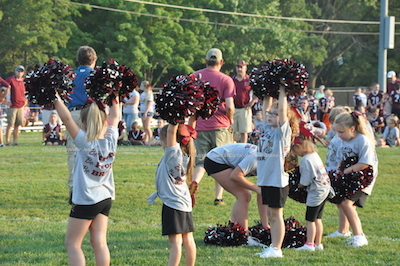 Cheerleaders add spirit to the festivities. Photo by Jennifer Jean Miller. “All of our athletes are committed to football, and cheer has been inspirational,” he added. Some of the Braves watch as the cheerleaders assemble on the field. Photo by Jennifer Jean Miller. 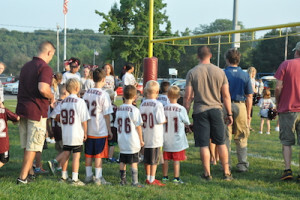 The field at Memory Park was packed with players from all divisions including: Flag-White, Pre Clinic, Clinic, Super Pee Wee, Pee Wee, Junior Varsity, Varsity and Flag Maroon. One of the players just introduced, runs onto the field, greeted with cheers. Photo by Jennifer Jean Miller. Some of the Braves enjoying the ceremony. Photo by Jennifer Jean Miller. Cheerleaders welcome varsity players onto the field. Photo by Jennifer Jean Miller. One of the divisions lined up during the introduction. Photo by Jennifer Jean Miller. Local dignitaries were in attendance from the Town of Newton and the County of Sussex. Deputy mayor Sandra Diglio and councilmen Kevin Elvidge and Wayne Levante were present. Debbie Danielson, the town’s recreation supervisor, was also recognized. 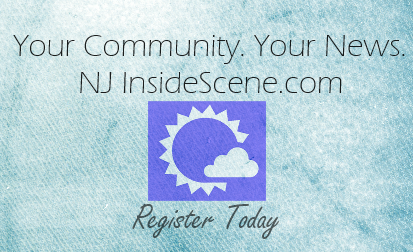 County freeholders Gail Phoebus and George Graham were there. “I heard the boys very loud,” said Graham, regarding the cheering from the players on the field, “I heard the girls very loud, but not the families.” Graham raised up his arm at the packed audience, signaling for their cheers. Sussex County Freeholder George Graham raises his hand to encourage cheers from the crowd. 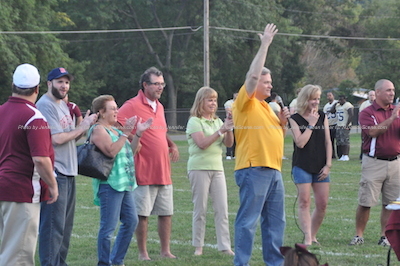 From left to right: Newton Councilman Wayne Levante, Newton Deputy Mayor Sandra Diglio, Newton Councilman Kevin Elvidge, Graham, Sussex County Freeholder and Assembly Candidate Gail Phoebus, and Town of Newton Recreation Supervisor, Debbie Danielson. Photo by Jennifer Jean Miller. 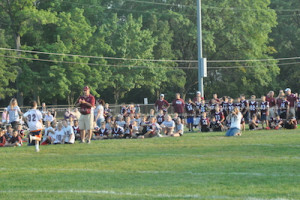 He encouraged parents to savor the times with their kids on their teams, whether it is drizzly or cold. He said some of his fondest memories of his children from their childhood, was when they were playing on their teams, and he was on the sidelines cheering them on. 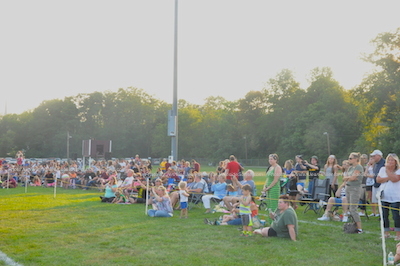 Parents on the sidelines enjoying the pep rally. Photo by Jennifer Jean Miller. Terri Boscia was also present from Toyota World of Newton, and Subaru World of Newton, one of the major sponsors of the league. 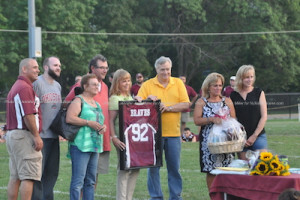 She was presented with a framed jersey and gift basket in appreciation. Dignitaries pose together on the field. Photo by Jennifer Jean Miller. The Robert Catanio Scholarship, “The Love for the Game Award,” was given out to the varsity team. 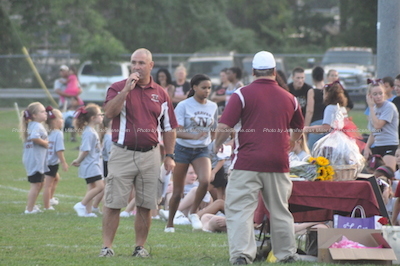 Catanio was a regular at games, and succumbed to a battle with cancer. 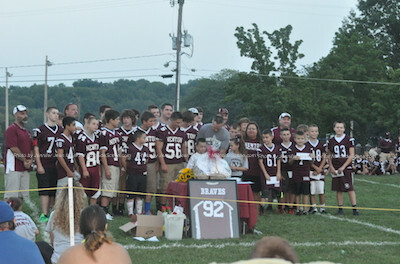 The scholarship presentation was a heartfelt event involving his family. During the rally, each player and cheerleader was introduced. Members of the Sussex Stags Football Team were also in attendance. The Stags’ own Leigh Kean sang the National Anthem. 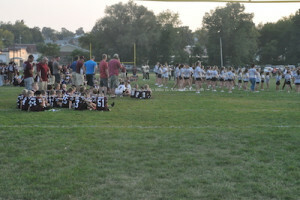 The cheerleaders performed on the field. Following the ceremonies, a DJ spun tunes for all attendees to enjoy, while they feasted at the barbecue. 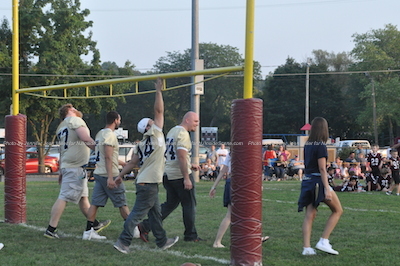 The dunk tank was a focal point and Young, coaches Teddy Sibblies and Shawn Mercer, Hut Manager Jacquie Ferdenzi, and Kenny Teets, were all dunkees. Members of the Sussex Stags enter the field. Photo by Jennifer Jean Miller. The following day, the Trophy Game took place at Newton High School. The Anti Bully Squad was a part of the festivities that day, as one of the partners.